Three members of the Legislature tell the St. Louis Post-Dispatch that President Trump’s administration is “actively gauging” the mood in Missouri about the way to handle Governor Greitens’ fate. The newspaper report also says some legislators have reached out to the White House and others have been contacted by the Trump administration about the subject matter. Mizzou political scientist Peverill Squire thinks Trump is trying figure out how much his reputation is damaged by what people think of Greitens’ situation. “I know there are a number of Republicans that would probably like to have the administration help pressure Governor Greitens to leave and the administration will have to decide whether that’s a step that they would really be willing to take,” Squire says. Greitens is being investigated for allegedly using violence and manipulating his ex-mistress into performing sexual acts in 2015. Squire tells Missourinet Trump has his own controversies – some similar to Greitens. “I think they would (Trump officials) prefer to stay out of it and not have the two too closely linked by having the administration come in and try to push out Greitens at the same time they’re resisting any attempts along those lines in terms of keeping Trump in office,” Squire says. If Trump calls on the governor, a Navy SEAL, to resign, would Greitens listen? 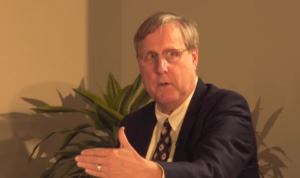 “It’s not clear that the governor would be willing to listen. He has, to this point, ignored a lot of prominent members here of the Republican party in the state who have asked him to resign. It certainly would be hard to resist pressure from Trump and Vice President Pence, who has a relationship with Greitens. But, he (Greitens) has dug in his heels to this point and it may take something even beyond the president to remove him,” says Squire. 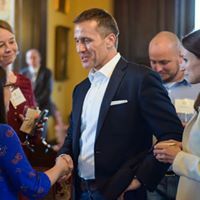 On Tuesday, Senate President Ron Richard of Joplin, House Speaker Todd Richardson of Poplar Bluff, Speaker Pro Tem Elijah Haahr of Springfield and Majority Floor Leader Rob Vescovo of Arnold all called on Greitens to step down. Richard went a step further and said he thinks impeachment proceedings should begin immediately. Minutes later, the governor jumped on Twitter to say he’s not giving up. Officials from the Missouri Republican Party seem to be staying out of the fight. On Tuesday, Missouri Attorney General Josh Hawley said evidence shows fellow Greitens might have committed a felony by taking and using a charity donor list for campaign fundraising. 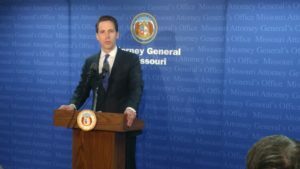 Hawley says the St. Louis Circuit Attorney’s office holds the power to decide whether to file charges against Greitens for allegedly getting the list without permission of officials from Greitens’ former charity. An attorney for Greitens has filed a temporary restraining order that aims to remove the Attorney General’s office from investigating Greitens and his administration. The request filed this afternoon in Cole County Circuit Court also asks to assign a special prosecutor for any further investigative work.